Melt the chocolate, butter and Madeira together in heatproof bowl over simmering water (bain marie). Whisk the eggs and sugar until light, fluffy and white and so they make ribbons when you run your whisk through them. Add the chocolate and butter to the eggs and sugar. Gently fold in the flour. Pour into individual silicon moulds and bake for 15 to 20 minutes. Melt the chocolate, cream and Madeira together in heatproof bowl over simmering water (bain marie). remove the cakes form their moulds and pour the chocolate icing over the cakes and refrigerate to set. Remove the seeds from the vanilla pod and mix into the crème fraiche with icing sugar. Keep refrigerated. 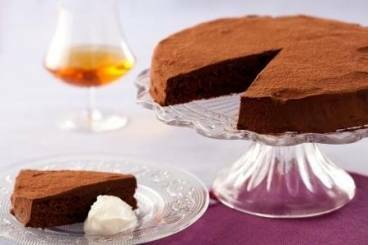 Place the cake in the middle of a plate and make a quenelle of crème fraiche to place on top.